Despite the fact that proper dog dental care is essential to good health in your pooch, statistics show that two-thirds of all pet owners do not take care of their pets’ teeth as recommended by their veterinarians. The unfortunate result of this lack of dental care is shown in the 80 percent of all dogs that have symptoms of oral disease by their third birthdays. Because dental problems can affect other areas of your dog’s body, including the lungs, kidneys and heart, it is essential that you care for your pet’s teeth right from the very start of his life. These AAHA guidelines will help you to do just that. Periodontal disease can become a major problem for your dog if left unchecked. The first sign of trouble is often acute “doggy” breath, so if you begin to notice this issue, contact your veterinarian for a dental exam. The first stage of periodontal disease is generally plaque, or a bacterial film on the surface of the teeth. In the early stages, plaque can be easily dislodged when you brush your dog’s teeth, or when he chews on hard toys or food. If the plaque is not removed at this stage, the bacteria will attach to the teeth and become calcified through the calcium in your dog’s saliva. This hard surface becomes tartar, and more plaque will accumulate on top of it. Unchecked plaque can lead to gingivitis, which is recognized by red, swollen, and inflamed gums that will bleed easily. Once your dog reaches this stage of plaque, it will take a professional cleaning to get the tartar off of his teeth and heal his gums. If the plaque is not taken care of at this point, an infection can form around the root of the tooth. Progression will include the deterioration of the tissue surrounding the tooth, the erosion of the tooth socket, and a loose tooth. This process is just about as fun as it sounds, and can most definitely be painful for your dog. The good news is that regular dental care can prevent this entire nasty process from occurring in the first place. Your dog’s dental care should begin in his puppy phase of life. Your veterinarian should check your pup for a number of issues, including missing any teeth, or any unusual swellings or changes during your dog’s oral devleopment. Once your pet passes through his puppy stage, your veterinarian will manage his dental care with regular examinations and cleanings. In the later years of your dog’s life, your vet will begin checking for plaque and tartar buildup that must be professionally cleaned out, developmental issues, tumors in the mouth, and progressive periodontal disease. Generally, your dog can get an oral examination during his regular checkup, but for cleanings, anesthesia is usually required. Your dog may need a cleaning and more thorough examination of this nature every year, beginning at the age of one for smaller dogs, and at two years for larger breeds. Administering a pre-anesthetic exam before administering any type of anesthesia to your dog. This will ensure that your pet is healthy enough to handle anesthesia, and can be performed with the aid of tests like x-rays, urinalysis, blood tests and an electrocardiograph. Sometimes a simple visual examination will be sufficient, depending on your dog’s age and physical condition. While there are always some risks involved with anesthesia, this exam can do much to reduce those risks to your dog. Anesthesia monitoring, which tracks your dog’s vital signs while he is under anesthesia. These important signs include your dog’s respiration, body temperature and heart rate, and they will help to ensure that your dog is safe while the anesthesia is administered. Dental x-rays can give your veterinarian a more comprehensive look at your dog’s overall oral health. Dental x-rays can help a veterinarian detect abnormalities in the mouth that may not be visible with a regular examination. While these x-rays may lead to the necessity of pulling loose or infected teeth, this process can be an important step in keeping your dog healthy. Scaling and polishing, processes similar to some you receive at your dentist’s office. The instruments used to get rid of the plaque on your dog’s teeth are very similar to the ones that would be used on you. 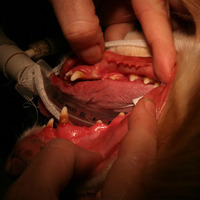 Your vet can also use a polish on your dog’s teeth that will smooth out rough areas and complete the cleaning process. He may apply a barrier substance, like fluoride, that will effectively prevent future plaque as it strengthens your dog’s teeth. Taking your pooch to the veterinarian for regular dental care is only the beginning. It is important for dog owners to brush their pets’ teeth at home regularly as well. Special supplies for brushing canine teeth are available at many veterinary offices and pet supply stores. By taking these simple steps to keep your dog’s teeth and mouth healthy, you will go far in keeping the rest of him healthy also. Some studies show that you can add up to five years onto the life of your pet by adhering to a schedule for responsible dental care. Talk to your veterinarian today about how to keep your dog healthy, and happy, through routine dental care.